Parking lot 31A in Bethesda, MD on the corner of Bethesda Ave and Woodmont Ave is closed for the next 60 days or so for utility relocation. This is the really small parking lot, not the big one across the street. The closure is part of a larger project to build a large mixed-use building on the site of the current lot 31 (the large lot across from Barnes and Noble). That project will include a garage with public parking. From reading the sign, it looks like there may be temporary lane closures on Woodmont Avenue related to this construction. 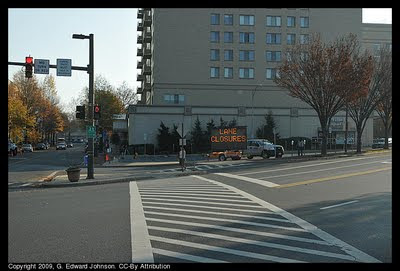 This lot closure has been scheduled many times before. First they were going to do it at the beginning of May, then in mid-June, then at the start of September, then on (or about) November 1st, then on November 16th. Other blogs might have jumped the gun and reported the 11/1 date, but not me, quadrice bitten twice shy. UPDATE November 24th: "Closed" is a relative word, and in this case it means that several of the parking spaces are fenced off for storage of equipment. The rest of the small lot is still open however. UPDATE December 7th: Apparently they re-scheduled the closure of the full lot to today but the re-scheduled it again for sometime in January 2010. So that is at least the seventh scheduled closing date. Never have I seen so much effort go into closing so few parking spaces. I wouldn't hold my breath for the January date being the real date. Today is a really nice day. Much better than I thought it would be and it is a great day to get outside and enjoy the warmth. This afternoon should be near 70 degrees. 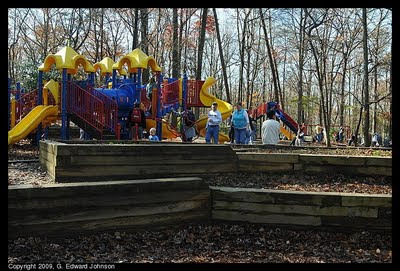 The big playground at Cabin John Park had lots of kids running around playing when I went by there earlier today. Tomorrow should be pretty nice too, not as warm as today but not bad for this time of year. This fountain is practically next to last week's one, however, architecturally they couldn't be more different. 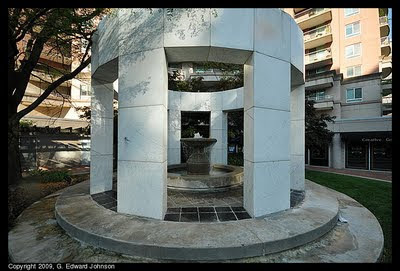 The other fountain in Bethesda Place Plaza is more of a large shallow pool. This is a more traditional fountain and has a raised stone 'roof' It is on a very small hill and surrounded by trees. 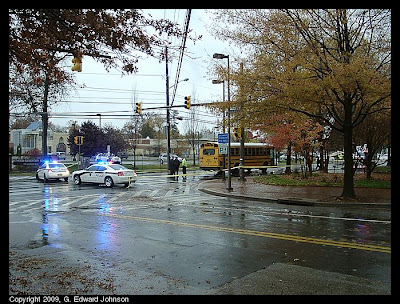 Around 1:30 this afternoon a woman was struck and seriously injured by a school bus in front of Bethesda Elementary school, 7600 Arlington Rd., Bethesda, MD. 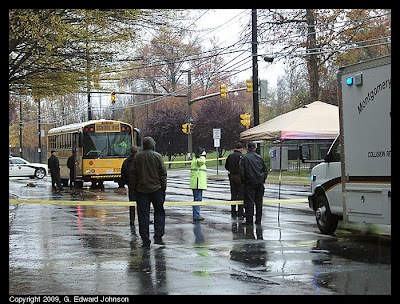 Five students were believed to be on the bus at the time of the accident, none of them were injured. The woman later died from her injuries. As of 4:00pm, Arlington Road between Old Georgetown Road and Edgemoor Lane in both directions was still closed for accident investigation. Alternate routes were crowded. Update: 5:25pm: Arlington Rd in both directions is now open. The definition of a fountain can be hard to pin down. Do you really need water spraying in the air? I don't think so. 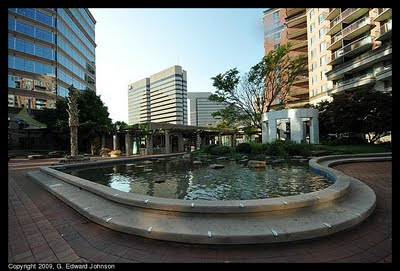 In the middle of Bethesda Place Plaza is a large shallow pool with rocks in it. On weekends you see kids jumping from rock to rock while waiting for a table at the Original Pancake House. Sooner or later one will miss the rock and land in the water. Even though it looks calm, there is a bit of a current because of the filter. 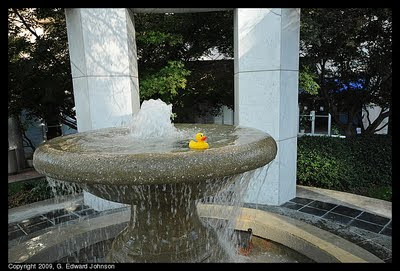 I almost lost the duck because he went for a swim in the middle of the fountain. 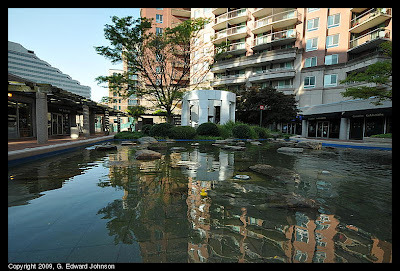 Bethesda Place Plaza is easy to miss since it is raised a bit from most of the roads. You can get to it by going up stairs on Woodmont Ave, or the stairs by the Safeway on Old Georgetown Rd, or up some stairs of Commerce Lane, or from Wisconsin Ave (MD-355). In the summer they have lunchtime concerts here too. For lunch today I made a trek to the ver edge of downtown Bethesda, MD. 8102 Norfolk Ave to be exact. Cornucopia specialty foods has imported Italian food, cheeses and lots of cookies. The purpose of today's visit was to get a sandwich for lunch so I skipped the plates with cookies piled high on them (this time). I tried the Tuscan Rosmary Ham sandwich. The ham had a light coating of rosemary on the edge which was very flavorful. It went wonderfully with the balsamic vinegar that they put on the baguette. There was also cheese and tender lettuces on the sandwich. This is a really nice sandwich, fairly simple but with a distinctive flavor that sets it apart from other ham sandwiches I have had. The only downside was that the cheese couldn't compete with the rosmary and balsamic vinegar, I really couldn't taste the cheese at all. There is limited seating there making this more of a place to pickup lunch and take it with you. It is also closed on Mondays.